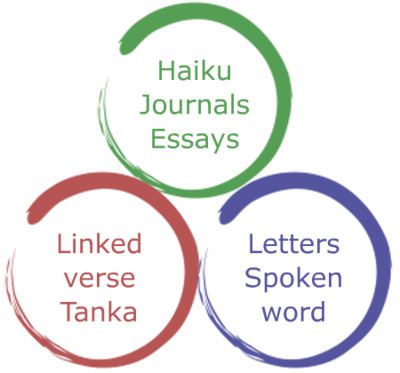 Basho4Humanity | Basho on How to Write Haiku ( Poetry and Music ) | English collection of Basho's linked verse, tanka, haiku, letters, prose, letters, and spoken word about humanity - with commentaries to enable the ordinary reader to understand and enjoy Basho's words. you will get mixed up in oldness. Basho’s words are completely, utterly simple. No complications: seven ordinary words with the most basic grammar possible in Japanese and likewise in English. 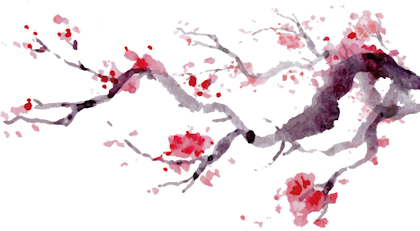 He says absolutely nothing new about cherry blossoms or memories – instead he ‘sums up and conceals’ a thousand years of poetic expression on these flowers and the memories that pass from one cherry blossom season to the next. The plain and ordinary words are “realized” through the thousand years of associations of Japanese life with cherry blossoms. Thus ordinary words take on extraordinary meanings and feelings. the experience of the heart which goes and returns.. . This single renku stanza combines the intriguing trio of child, whale, and shell; we start with medium-size child, then move out to enormous whale, return to small shell in boy’s hand, then spread out to fill the area with sound, the whale swimming away, the adults running to their boats, the boy watching excitedly from his post. So much life and aliveness. That disease is “oldness,” conventionality, heaviness in writing. A three-foot child would be five or six, so have little higher cortical function to circumvent native spontaneity of the lower brain. 6 Only this, apply your heart to what children do. Children’s actions are whole, not divided by the endless conflict of adult concerns. Strive to write poetry with that wholeness. Haruo Shirane defines Lightness as: “a stress on everyday common subject matter, on the use of vernacular language, and on a relaxed rhythmical seemingly artless expression” -- each of these conspicuous in UNDER THE TREES. so HURRAY! We are celebrating the season of warmth and new Life. Lightness is Us, real people having fun, sharing food. the times when we ate those foods, times we celebrated together. 9 Do not allow your verse to be artificial. No one surpasses Kikaku in exaggeration, so let us forgive him. 10 The verse HOARSE SHRIEK is Kikaku. only for people off in some fantasy world where monkeys shriek. It is literary and “old.” Basho’s verse is REAL and Light. Words from the heart are good. Words from other words are not. one sound stagnates in your mouth, scrutinize the expression. Recently I considered changing the middle segment to “things brought to mind” or “thoughts come to mind” – but when I spoke these phrases out loud, I found that they “stagnate” in my mouth. “Things come to mind” is natural English and resonates. neither heavy nor merely spinning about. A beggar sleeps under a straw mat in the freezing cold New Year’s weather. He has an identity, a human dignity within the glory of spring. If not for fortune, I could be him. The verse goes straight to its sociological meaning; it does not “spin about” aimlessly, yet is not “heavy”; it does not shove that meaning at the reader’s face. 15 In poetry is a realm which cannot be taught. The image of “little monk” makes the child “stand out,” the bald round head on a child‘s body sitting on the horse high above the horizontal field, watching his elders at work. (See the painting.) This “standing out” is what “makes” the verse. The light color and roundness of the boy’s head are “cute,” while pulling gargantuan white radishes from the ground is dirty and rough. The important word here is “stand out.” Unless something “stands out in relation” to something else, there is no poem. 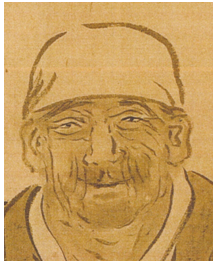 Two months before his death, although it was autumn, to his long-time followers aged like himself、Basho wrote a Spring verse. For the “physical form” to be “graceful,” I believe the verse must have a consistent rhythm of beats. Basho speaks of a “quality of turning" so the words have an accent and are not flat or boring - yet even with all that “turning,” the rhythm is a steady four beats per measure. By translating with a consistent four -beat rhythm 3 beats and pause / 4 beats without pause / 3 beats and pause – and using ordinary English words which (I hope) resonate, I aim for the graceful physical form with a musical quality Basho describes.